How do I know if my property has any wetland areas? Wetlands are areas inundated or saturated by surface or ground water at a frequency and duration sufficient to support a prevalence of vegetation typically adapted for life in saturated soils. Identification of the extent of any wetland areas can be done by reviewing the recorded subdivision plat. If the wetland is not depicted on the plat, an environmental professional will need to be hired to delineate any potential wetland areas. What do I do if wetland areas exist on my property and I want to clear it, place fill on it or build? 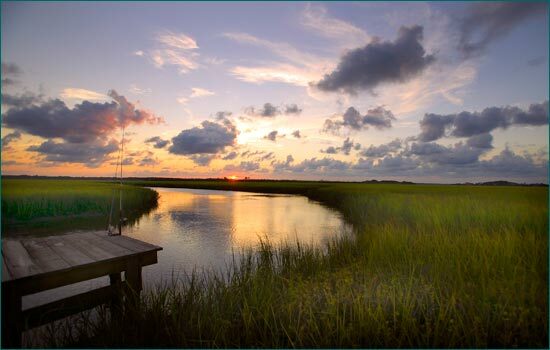 Wetland areas are protected by law and must remain in their natural condition. If you propose to dredge, fill, or cut any vegetation within a wetland for activities on property in the County, then wetland regulating agencies must be contacted first for permitting requirements and then the County must be contacted for other applicable preservation requirements. What is the difference between flood zones and wetlands? Flood zones are geographic areas that FEMA has defined according to varying levels of flood risk. Wetlands are those areas that are inundated or saturated by surface water or ground water at a frequency and duration sufficient to support a prevalence of vegetation typically adapted for life in saturated soils. What is an upland buffer and when is it required? An upland buffer is a strip of land along the edge of wetland areas to remain undisturbed with all existing vegetation. Different sized upland buffers are required depending on the type of development project, type of wetland, or location. Generally, a 50-foot upland buffer is required landward of the state jurisdictional wetland line for all tidally-influenced water bodies up to the point where a Mean High Water Line can be set and a 25-foot upland buffer with an additional 25-foot building setback from the buffer is required from all other contiguous wetland areas. Isolated wetland areas, or closed depressions surrounded by uplands, do not require a County upland buffer.